Why do readers claim that fictional worlds feel real? How can certain literary characters seem capable of leading lives of their own, outside the stories in which they appear? What makes the experience of reading a novel uniquely pleasurable and what do readers lose when this experience comes to an end? Since their first publication, nineteenth-century realist novels like Pride and Prejudice and Anna Karenina have inspired readers to describe literary experience as gaining access to vibrant fictional worlds and becoming friends with fictional characters. While this effect continues to be central to the experience of reading realist fiction and later works in this tradition, the capacity for novels to evoke persons and places in a reader's mind has often been taken for granted and even dismissed as a naive phenomenon unworthy of critical attention. 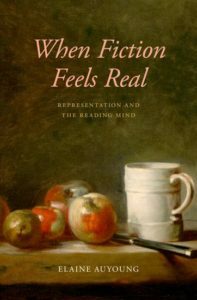 When Fiction Feels Real provides literary studies with new tools for thinking about the phenomenology of reading by bringing narrative techniques into conversation with psychological research on reading and cognition. Through close readings of classic novels by Jane Austen, Charles Dickens, George Eliot, and Leo Tolstoy, and the elegies of Thomas Hardy, Elaine Auyoung reveals what nineteenth-century writers know about how reading works. Building on well-established research on the mind, Auyoung exposes the underpinnings of the seemingly impossible achievement of realist fiction, introducing new perspectives on narrative theory, mimesis, and fictionality. When Fiction Feels Real changes the way we think about literary language, realist aesthetics, and the reading process, opening up a new field of inquiry centered on the relationship between fictional representation and comprehension. Elaine Auyoung is McKnight Land-Grant Professor at the University of Minnesota, Assistant Professor of English, and Affiliate Faculty of the Center for Cognitive Sciences.